Just when we thought that we've seen everything the Japanese market could possibly offer in the way of weirdness, we have to stand corrected. A new iPhone 5s case, supposedly produced (or co-produced) by Japanese carrier KDDI, has now firmly entrenched itself on top of the food chain, at least as far as unorthodox (to put it mildly) smartphone accessories go. Yes, this one tops the bathing lady iPhone case we told you about some two years ago. That one is keeping it perfectly within the boundaries of normal in comparison with what we have here. 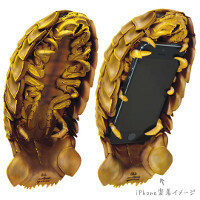 Indeed, this case, shaped in the form of a Giant isopod, is well-deserving of 'the creepiest iPhone case' title, and raises some very serious question as to the type of audience that may consider purchasing one. Beyond the mortifying looks of the case, however, there are also practical considerations. For one, this case measures in at 205 x 105 x 50 mm, and weighs the whopping 294 grams! What's more, there seems to be no opening for the camera, so you'll basically have to fight the isopod for your phone when you want to take a snap. Luckily, there's both a silver and gold version. Seeing as gold is oh so trendy right now, it makes sense that the gold-colored model is in limited supply, and only 500 units will be made available. A pity. Geezus... Their from Japan! What do you expect? They have tentacles, bocu no pico and other weird stuff..
Hopefully they make an alien face hugger case! That would be awesome! Weekend PhoneArena articles are the worst. Comes to show iOS has bugs. Finally, a case to improve the aesthetics of the iPhone; iThink it's Apropos. Besides, it's beautiful! This and Apple's price tag is a beautiful combo indeed :). No offense.